Andreas Olofsson, the founder and CEO of Adapteva, had a problem. He had built a computer chip that could deliver the horsepower of a supercomputer on a smartphone or a tablet. His Epiphany chip design was manufactured and then placed on circuit boards used by the military, but at $10,000 for a board, most businesses and the consumer electronics market wouldn’t touch them. Given how anxious people are about the battery life on their mobile phones and how much more computing these devices are handling, one would think venture capital firms would rush to back Adapteva, which launched in May 2011. But Olofsson couldn’t find investors. He blames it on the reluctance of venture firms to back chip startups — and they certainly are leery of investing in capital-intensive hardware startups– but it could have been any number of reasons: bad business plan, a realization that handset makers weren’t going to swap out a Qualcomm application processor for an untried Adapteva option, or something else. But instead of packing it in, Olofsson has turned to Kickstarter to bring his vision of supercomputer power in a tiny, low-power package to the market. He wants to sell a processor on a stripped-down board in two sizes as well as open source the software that will be needed to operate and program the chip. Called the Parallella project, the plan is to offer the 16-core board to those who pay $99 with the goal of raising $750,000. If the team can reach a stretch goal of $3 million it will also offer the 64-core version of its chip for $199. Olofsson says he was inspired by the market and hobbyist community that’s building around Arduino boards and the Raspberry Pi, a low-power and low-cost computer. Earlier this month researchers at the University of Southampton made a supercomputer using LEGO bricks and Raspberry Pi modules. Olofsson acknowledged that project but pointed out that the Adapteva chip could deliver a lot more power — the 64-core version of his board delivers 51 gigahertz (compared to the 1.4 gigahertz processor inside the Samsung Galaxy 3) while consuming only five watts (that’s still a lot for a phone). The Parallella boards will cost more however. Arduino boards or Raspberry Pi computers cost roughly $35 each as opposed to $99. But Oloffson is undaunted. He says researchers are already playing around with Adapteva chips for supercomputing and other projects, and aims to build a community. Kickstarter’s recent changes on how hardware companies will list their hardware caused minor launch snags for the Adapteva team, but nothing major. In fact, the Kickstarter changes, which were designed to emphasize the funding nature of the platform instead of having people who backed products thinking of it more like a store, fit with Olofsson’s ideals. For him, bringing massively parallel computing to phones and other devices is a mission, not just a business. Indeed. After raising a Series A of financing and taking on a convertible note to get to this point, Oloffson is betting his hopes on the Kickstarter community. There will be no Series B for Adapteva. In exchange for the community support, he’s stripped down his board and is opening up parts of his business that would be impossible for another chip company, where IP is everything. Make no mistake, this is a Hail Mary pass for his company, but it’s not one other chip startups could necessarily follow. If Olofsson succeeds it may seem to be a new way of backing capital-intensive hardware firms, but in reality Adapteva spent $500,000 even getting the first version of its chips made. The military and its Series A strategic investor bore that cost, but declined to support the move beyond the $10,000 boards that are currently all Adapteva has to get people to embrace its new design. Let’s see if the Kickstarter community decides to give Adapteva and massively multicore parallel computing a whirl. You may want to check that??? As of mid-2012, the highest clock rate on a production processor is the IBM z196, clocked at 5.2 GHz, which was released in June of 2010. So it would be impressive to have 5.1 GHz. I suspect they are doing some creative mathematics by saying if each core runs at 1GHz then 64 cores must mean 64 GHz. Correct me if my analogy is wrong here but cars don’t go faster just because there are more lanes on the highway. That’s one of the reasons Adapteva is so keen to get people using its chips. Scaling your cores linearly (or anywhere close) will need advanced in programming. 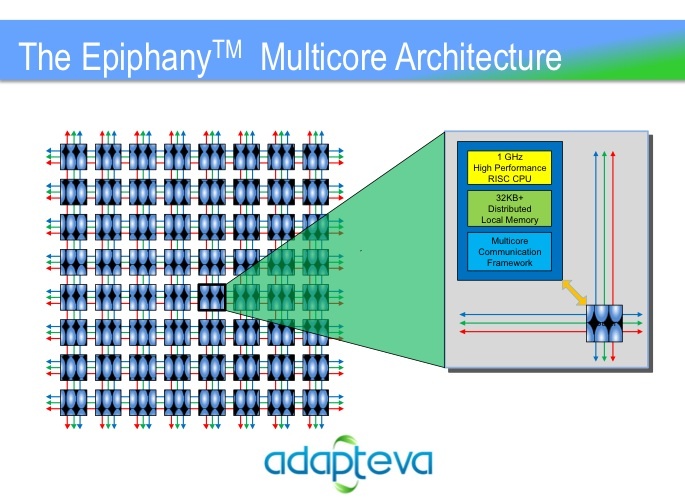 Adapteva uses a RISC-based architecture and on the 64-core version the cores are running at up to 800 Mhz and on the 16-core version they run at 1 Ghz. The Samsung Galaxy 3 has a dual core and a quad-core version. Is that what you are talking about? There’s also a 1.5 GHz and 1.4 Ghz version of the cores depending on the spec sheet and maybe carrier. My point being it’s an irrelevant statistic…what the liner addition of the clock speeds to any (N) number array processor is. Since the early 90s you have been able to link together Analog Devices SHARC processors in two dimensional arrays and NO ONE ever added the individual processor speeds together to give any kind of meaningful number.